Just some rivet-counting geekery today. 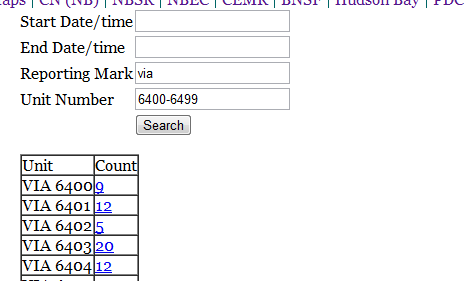 I've updated the code in the engine search portion of my train sighting database to allow a range of numbers to be entered. A few examples might be in order. Suppose I wanted to see which VIA F40PH-2 engines I've seen. I know they are numbered 6400-64something, so I would go here and enter VIA for the road name and 6400-6499 for the engine number. Each engine is listed with the count of the times I've seen it. Clicking on the count goes to a search for that engine number, listing each date/location I've seen a train containing that engine. Looking at the results, I've never seen VIA 6423, VIA 6430, VIA 6447, or VIA 6450. Why not? Well, all of them were wrecked / retired on or before 2001 when I started getting serious about recording engine numbers. Which engine did I see most often? VIA 6420. From my first record on May 18, 2003 in Moncton to June 7, 2011 in Winnipeg, I've recorded it 24 times. Note that this is a bit of a cheat because at times I would record it multiple times per day if I was chasing the train. On November 9, 2005 I chased the VIA Veteran Train from Brookfield, NS to Moncton, NB and VIA 6420 was the lead engine. Which NB Southern engine did I record most often? Surprisingly it was NBSR 2317, 89 times. Again it was part of a few chases so I saw it on less than 89 separate days. I would have thought it was one of the original GP38-3 engines, NBSR 980x.